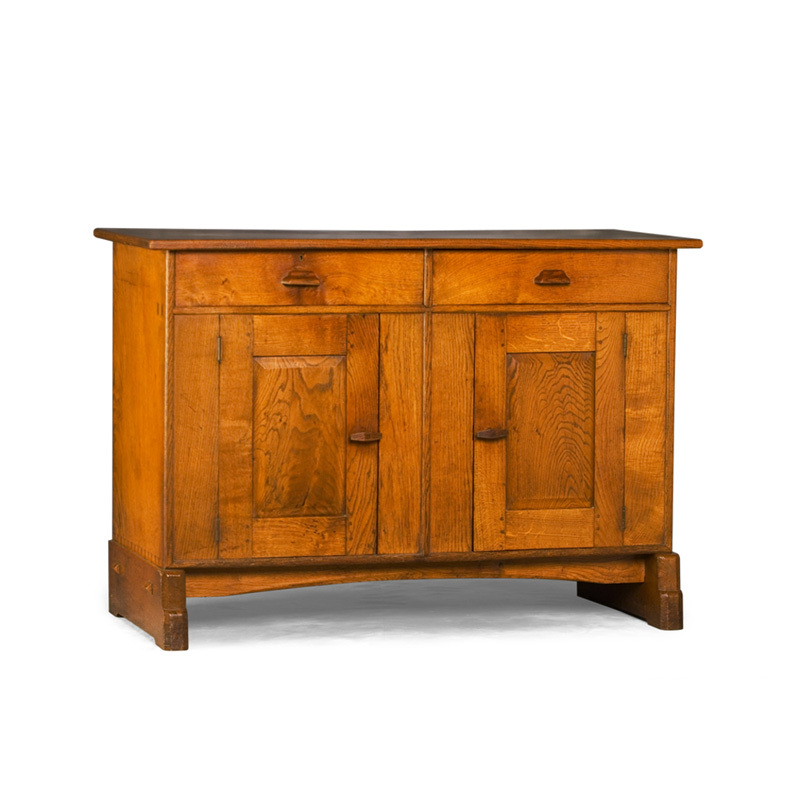 I was inspired to do a blog about Arts and Crafts style in decor after having gone to a Stair Galleries auction preview in Hudson, NY. 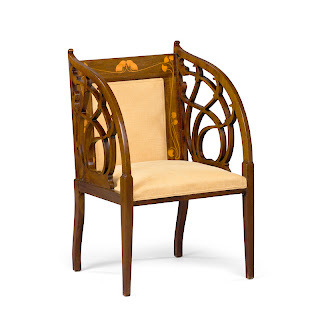 They have an auction coming up September 7th with Arts and Crafts and Aesthetic Movement items from the collection of John Alexander LTD of Philadelphia. This living room has the feeling of Arts and Crafts without being a slave to the style. The designer adds elements, like the three legged stool by the fireplace, that evoke Arts and Crafts, along with the architecture of the room. 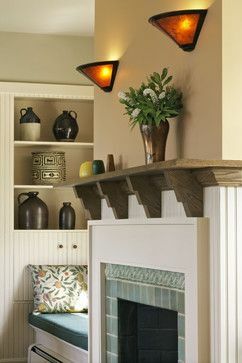 This photo illustrate nice Arts and Crafts details such as the fabric on the cushion and the vase on the mantel. You can have fun adding some Arts and Crafts elements to your decor at auction! All these items are from the Stair auction. We can start with this wonderful serving table. It has clean lines and is made from a wonderful, warn ash. It's English, circa 1924, and measures 51 inches long and is 21 inches deep. It's Lot 178 and has an auction estimate of $1,000 - $1,500. This would go with anything! 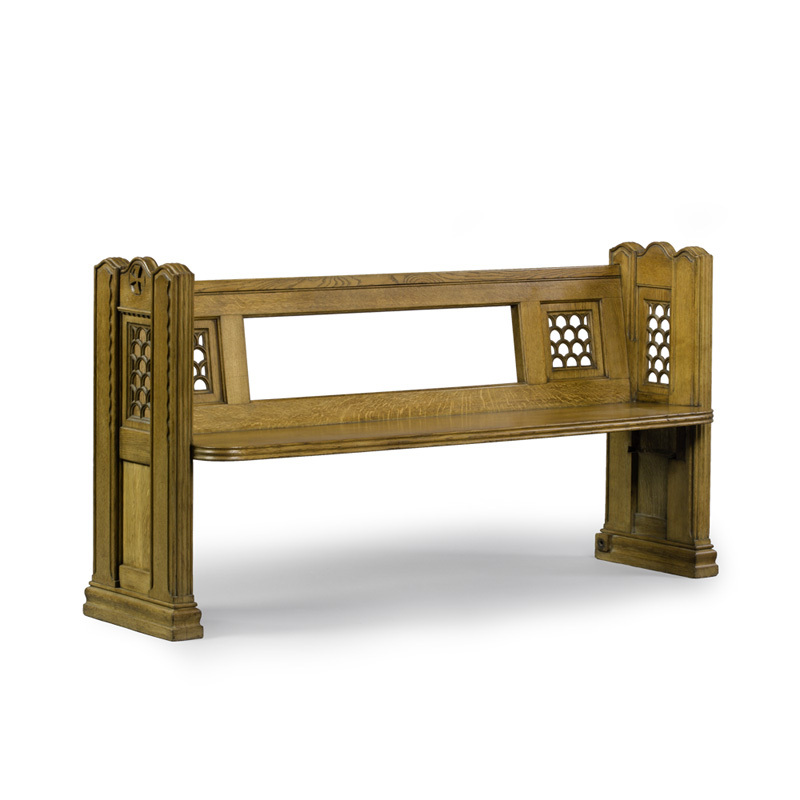 As an alternative to a bench in your hallway, try a church pew! This English carved oak pew (Lot96) measures 64 inches long and has an auction estimate of $400 - $600. It's so much more interesting than the ordinary bench, and would be a great place to sit and put on your boots before going outside. 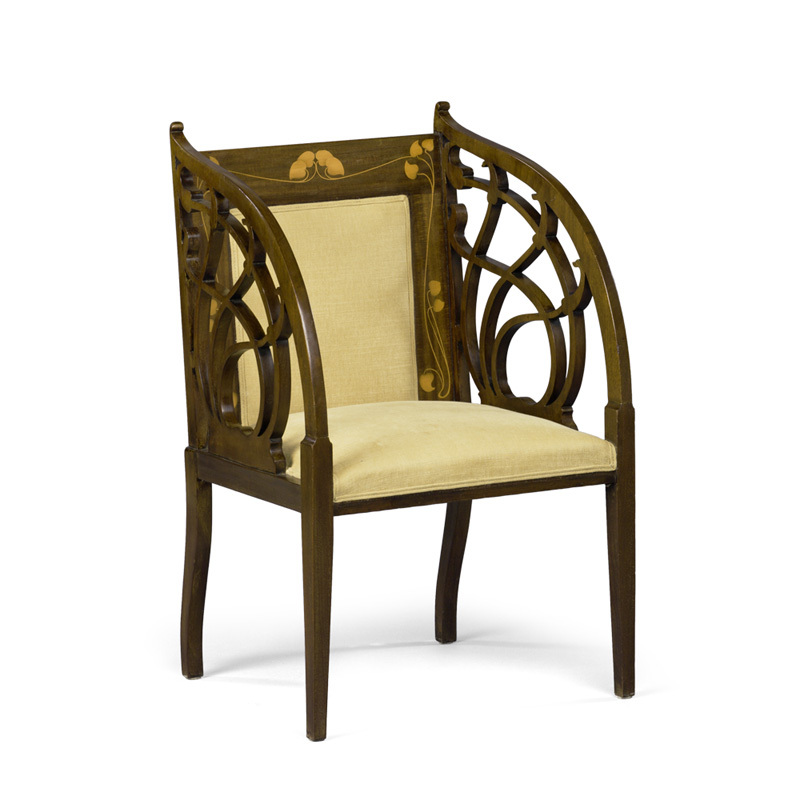 There nothing like a decorative chair to add an element of a style to a room without going all the way. I love this chair. It has everything - beautiful inlay, fabulous carved arms, and a warm patina to the mahogany. 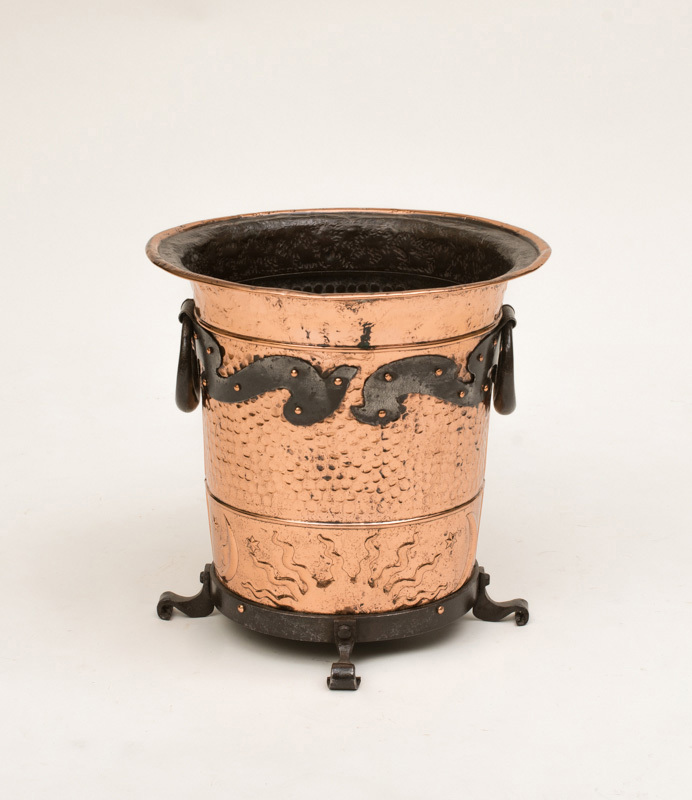 This is Lot 22, circa 1895, and has an auction estimate of $500 - $700. 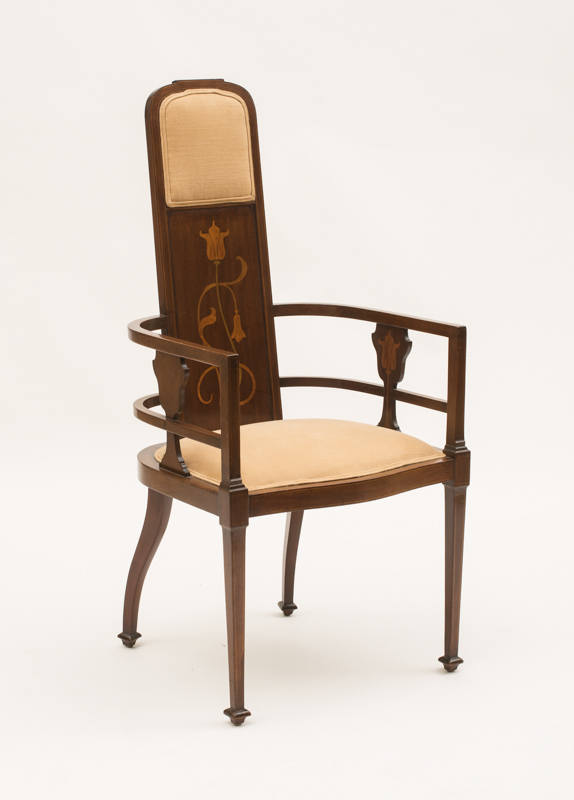 For a different shape, this lovely English circa 1895 mahogany chair would fit nicely into the conversation grouping, or be happy to sit filling a corner with decoration. It would also serve nicely in an entryway. It has a wonderful inlay decoration, and carved arms and legs giving it a lot of decorative interest. This is Lot 35 and has an auction estimate of $300 - $500. 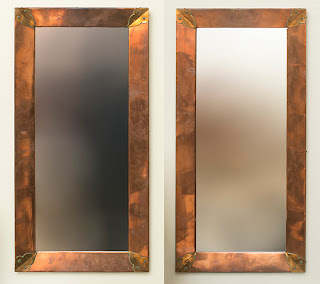 Of course, another way to add a style element without it being a piece of furniture is to use mirrors. These brass mounted Arts and Crafts mirrors have a wonderful simplicity about them. The warmth of the brass and the subtle design at the corners would work well in even the most modern decors. Imagine these in an entryway against a white wall! These are Lot 51and have an auction estimate of $600 - $800. I love objects for adding character to a room. 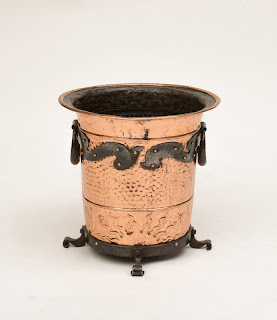 I am taken by this iron mounted copper coal bucket with all its decorative statements. Notice the sun rising at the base, the delicate hammered design along the middle, and the iron appliqued design along the upper edge. This is English circa 1900 (Lot 23), with an auction estimate of $250 - $350. Use it as a waste basket, a short umbrella stand, or as just another piece of decoration in the room. I couldn't do a whole room in Arts and Crafts, but I would be happy to add any of these items to my rooms for design interest, character, and fun!